Thank you to all for working on the Lions International Awareness Day. We were busy from 6:30am when Lions Graham, Erika and Ted arrived at the Lion’s Hall and Alistair and myself were at the shopping centre. Of course the day started before that as Lion Alistair spoke to the butcher (East Coast Meats) and Bakers Delight who gave a donation which enabled us to be able to start. We did however have to purchase more sausages and bread throughout the day. 1. We had Chippy the Lions Hearing Dog that we sponsored (and his owner Amanda) pay us a visit to show people just what Lions are involved in. 2. Our International Youth Exchange student Joshua (going overseas) also came along and spoke to people about the project. 3. Luke, the young man who wanted to raise funds for the John Hunter Children’s Hospital also came. This enabled him to participate in the rugby union, in which he was chosen to play at Coffs Harbour. Luke was put to work serving sandwiches and was a great help. What fun we had watching our Preso focus his attention on making a diamond from a lump of coal all the while keeping his eyes on the gong. We needed the help of local Lake Mac hypnotherapist Zoe Tylee to bring him back to the Club. Zoe was the guest speaker at our recent dinner and what an interesting night it was for all Lions who attended. We Win, We Win, We Win!! The Lions Club of Warners Bay under the stewardship of Lions Erika, Diana, Ted and Graham managed to steal the Zone Bowls Championship away from the Toronto Club. We will hold to the European Cup for as long as we can!! The Lions Club of Warners Bay and the District Lions Club of Edgeworth are joining ranks. We welcomed the members of Edgeworth into our Club. Together we will be stronger and able to meet the needs of both communities. This past Saturday our Lions Club raised $1,026 at the Swansea channel serving up sandwiches to over 300 hungry divers participating in the 5th annual Swansea Dive. This was by far the wettest event yet with over 25mm falling in the channel over the dive period - so it wasn't just the divers who got wet!! Thanks to all the Lions that supported this event! Congratulations to all of our Lions Club members, what a month we have had. Together we pulled off a very busy period and, as far as I know, all in harmony and having FUN... lots of ammo for Tail Twisting! Membership is important, but Club harmony is also important. The spirit in which our recent spate of projects was carried out showed we are well on track to rebuilding our Lions Club. I was most impressed with the vibes around the tables at our last dinner meeting. 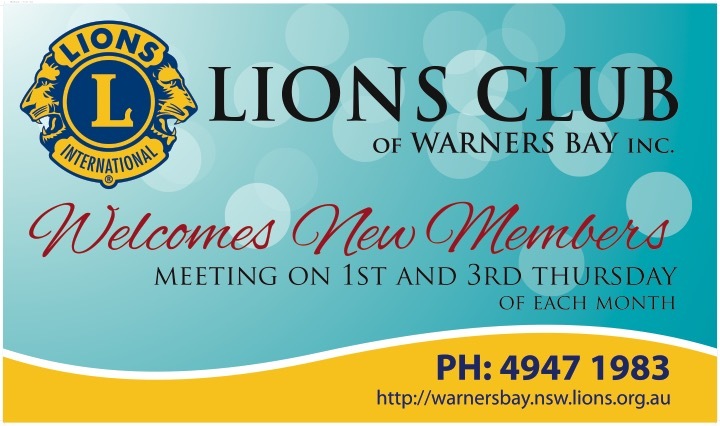 Our Club will be hosting the next Zone Bowls event early next year (date to be advised), so please come along and show the flag for Warners Bay Lions. We will need to supply supper. 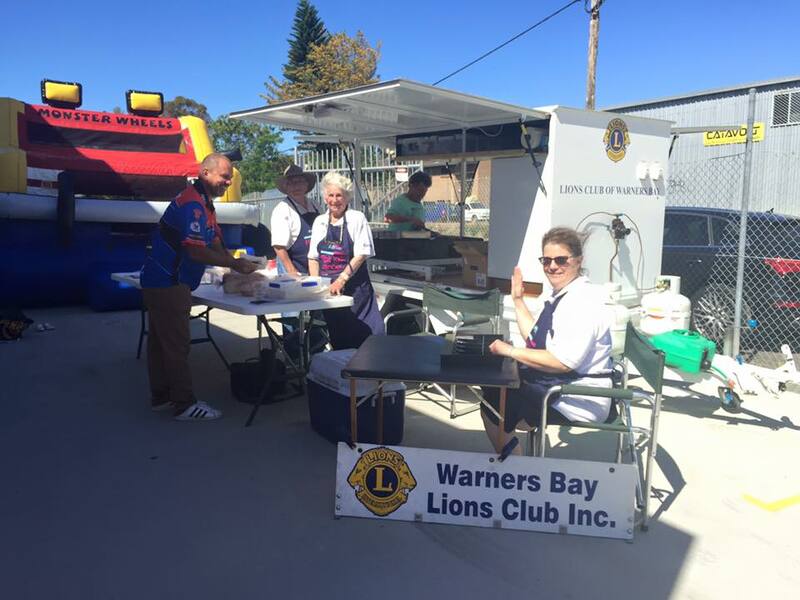 Due to early morning rain, Lion Gordon decided not to risk getting our Christmas Cakes wet and so cancelled our sales stall at the Warners Bay Chamber of Commerce Christmas Markets on Saturday, 10th December. A decision had to be made and he made it; we should support him in this action. Our next get together is our Christmas Party...You Beauty...see you all there; and if any of you can’t make it, Maureen and I wish you all the best for Christmas and Health and Happiness for the New Year. Lions braved the first heat of the summer (despite it still be November) and strong winds to serve up a Sizzle for the grand opening of the new AutoOne shop in Warners Bay. The proceeds together with a generous donation from the folks at AutoOne are going to the Childhood Cancer Research Foundation. Come one, come all! The Warners Bay Chamber of Commerce and Lake Macquarie City are once again sponsoring the Music in the Podium every Friday night (weather permitting) beginning November 4th. And the Lions will be cooking dinner. So why come down and enjoy the evening sunset, some good food and some excellent music under the stars with us at the Foreshore! Well you will be happy to know the Motions at this year Multiple District convention went our way. The two specific motions that I attended to convention to debate were GNM-10 and GNM-11. Both were soundly defeated. GNM-10 was proposed to limit the duration of the Convention to 3 days. This, in many Lions' opinion as well as mine would limit the creativity of future Convention organisers. While there will always be a limit from a practical point of view as well as that of the governing Council of the day, it was thought good to leave the duration to those governing the day. GNM-11 proposed mandate a Tuesday start for future conventions. I was passionate about defeating this motion as were many Lions my age and younger. The principle arguments against were a) why regulate this at all and b) the encouragement of those who are not retired and are still working the normal work week. Whatever the reason, this motion was lost. If you want to read more about the motions presented to the conventioneers, follow the link below. Monday (the 30th) was this year's Zone Bowls Final and the Lions from Toronto took the Europee'n Cup albeit by a narrow margin over Warners Bay. Fitting victory though as Toronto’s very own President Lyle will be our Zone Chair next year. Congratulations Toronto Lions for taking the cup for yet another year. Thanks to all that participated. This was by the far the largest number of Lions at this event in my short memory. Lion John Steel (Toronto) took some wonderful photos of our last event so now we have the final documentation of the great effort you all put into the Zone Bowls evening last week. You can find the via the link below. Lastly, let me send a warm thank you out to Morisset Lions for hosting the final. The four Clubs that hosted the Zone Bowls Challenge this year each did their own way and we all benefited. Thanks all! 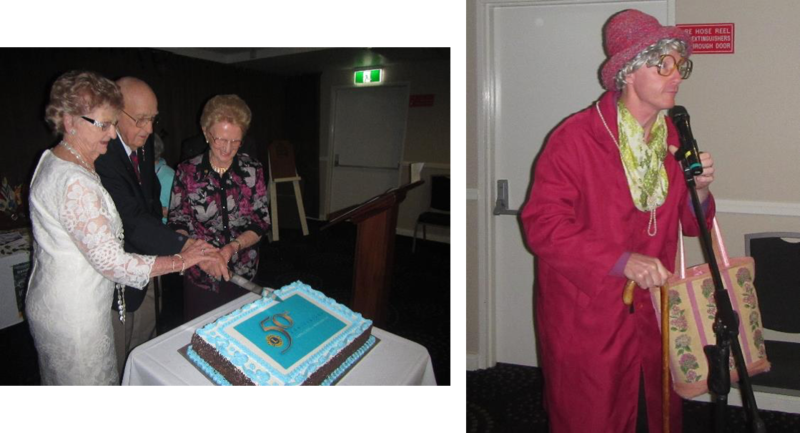 Warners Bay Lions Celebrates 50 years! What A Night… Our 50th Anniversary night, on Sat the 16th as previously mentioned, has come and gone and was, by all accounts, enjoyed by everybody. 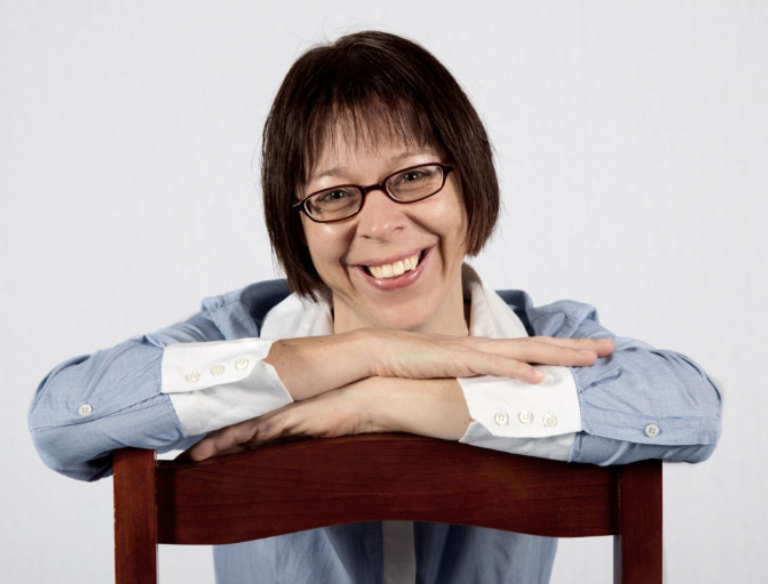 We have had phone calls saying “congratulations, we had a terrific night.” The bush poet was really the star of the night; when I looked around the room, I could see people laughing their heads off. The meal was excellent and the company was first class. Lion Alan greeted everyone at the door while Lion Tony checked everyone in. Lion Graham did an excellent job keeping things going, save for his Lions jokes (no comment). Lion Erika was busy selling raffle tickets. My sincere thanks to everybody who came along, making the night a successful 50th Anniversary Celebration. The committee which put it together was led by Lion Christine who really went flat out organising the event - I thank you for a tremendous night. Lion Graham organised the cake and Lions Lady Trude’ created the artwork for it, yet another highlight making it the night that it was. I am sure that Lion Don appreciated the effort by the Club to make the night very special for our only Charter Member in the Club. Chris McIntyre proposed the toast to Lions Clubs International. I was taken aback for he presented a toast that was even commented on by PCC John Kilpatrick as being the best he had heard. This anniversary night I will remember. It is the second last get together with the Changeover Night yet to come. At the first dinner meeting in May I will be presenting two cheques; one to the Lake Macquarie Music Society Eisteddfod, the second to the Swansea Dive Organisers. I ask all Lions to attend if possible on the night as I can assure you that these recipients were most delighted when asked to attend. Our Club gets a face lift! Have another look at our Clubhouse. We have installed a new sign welcoming new members to our Club. Thanks go to Lions Lady Trudé, Lion Greg and Graham for getting this project done. We were fortunate to have Professor Glenn Reeves of the Autoimmune Resource and Research Centre give us a talk on Autoimmune Disorders at our last dinner meeting. The Centre was started many years ago with the aid of a grant sponsored by our Club. It was a pleasure to entertain Glenn and his partner Dr. Sandy Reeves and I hope we can add to the $250 donation we made to this organisation in years to come. It’s before dawn on the 25th of April 1915. 4:30am the Australians are first to hit the rugged shore line, 2kms north of where they’re actually supposed to be. Many soldiers are pinned down by machine gun fire before they even leave the boats. But the ones who make it, run to the peninsula that’s so inhospitable, even the poorest of Turks avoid it and never even bothered to give it a name. Daylight comes and Australians are being pushed fatally ashore. Endless streams of machine gun fire poor down onto the soldiers. Bombs and grenades tear apart every piece of ground they land on and take the soldiers limbs with them. Soldiers drop to the ground and blood leaks from every angle of their mangled bodies and flows into the water. The waves lap red from blood and roll out to sea where the New Zealanders wait knowing they can’t do anything but watch the slaughter. 9:30am, five hours after the Australians land, the New Zealander’s go ashore. The furthest Australians are only 1km away from where they first land and the New Zealanders would find a similar fate. Except they have the added obstacles of 2000 dead and wounded Australian bodies, screaming in pain, lying, helpless on the sand. As the New Zealanders land, another 1000 are added to the casualties. No man is safe above ground. The Australians and New Zealanders are given the order to “Dig until they were safe, dig right in and stick it out” all while the smell of explosives suffocated every breath and the screams of their bothers rings like tinnitus. The Turkish army wasn’t given the order to attack, they given the order to die in the defence of their country. And die they did, but so did we. The Turkish counter-attack narrows the Australians and the New Zealanders into a mere 400 acre square, and as the men dig in, and the days pass, it becomes a 400 acre tomb. By this stage in the campaign, 50% of the men who landed are dead. On this day, 100 years ago, half way across the world, the ANZAC legend is born. It is something that will be commemorated for centuries to come but at the cost 11, 410 ANZACs from that campaign alone. Are you going to this year’s Multiple District Convention? Did you know it is in our backyard – Newcastle? It starts in earnest on Friday 30 April and will run for four days. Most of the activities are being planned for the Civic Theatre / City Hall and we’re expecting over 1,500 Lions, Lionesses, Leos and partners for this event. Our Club will be taking part in two very special events: Club Hosting on Thursday 29 April and tending the BBQ at Civic Park for lunch on either Saturday or Sunday the 1, 2 of May. More details will come next month but for now, why not log on to the MD201 Convention website and register your participation?